I made this garland last year and finished it just before Christmas. 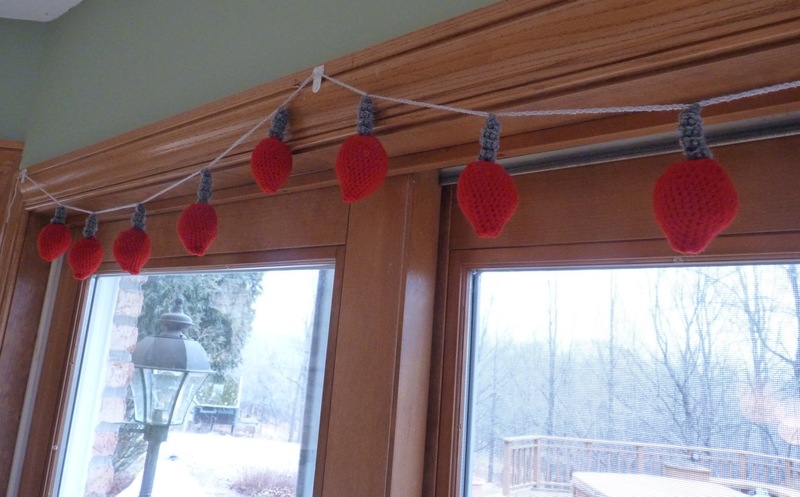 I decided to hang it over the patio door, so I just kept making bulbs until I had enough to span the door. I started out with a pattern for a Christmas bulb that I found online, but used just the pattern for the bulb part and made my own pattern for the base. If you look closely at the photo above, you can see that the top part is spiraled, which gives it the effect of a screw-in bulb. 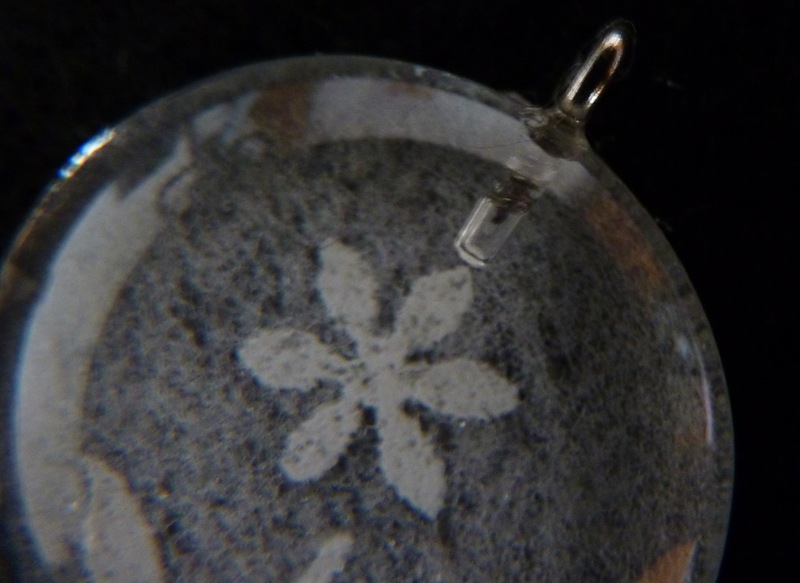 For each bulb, follow the instructions for the ornament body from this pattern. Starting in the 2nd sc from hook, 3 sc in each chain. You’ll see it start to curl up like a corkscrew. Finish off. Sew to the bulb. 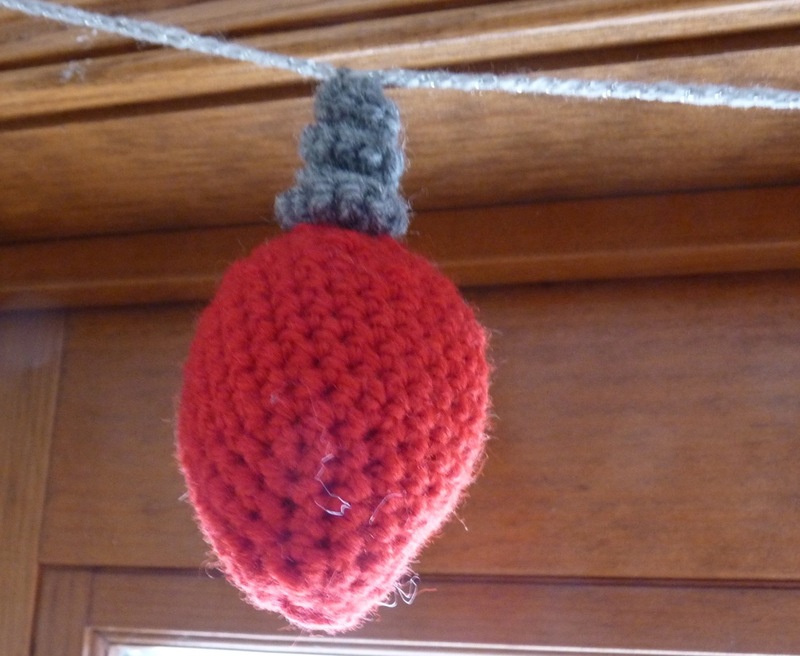 To make the garland, crochet a chain and slip stitch the base of each bulb to the chain, chaining an equal amount between each bulb. Finish off the chain. I used a 3.5mm hook instead of the 3.75mm hook called for in the bulb pattern. 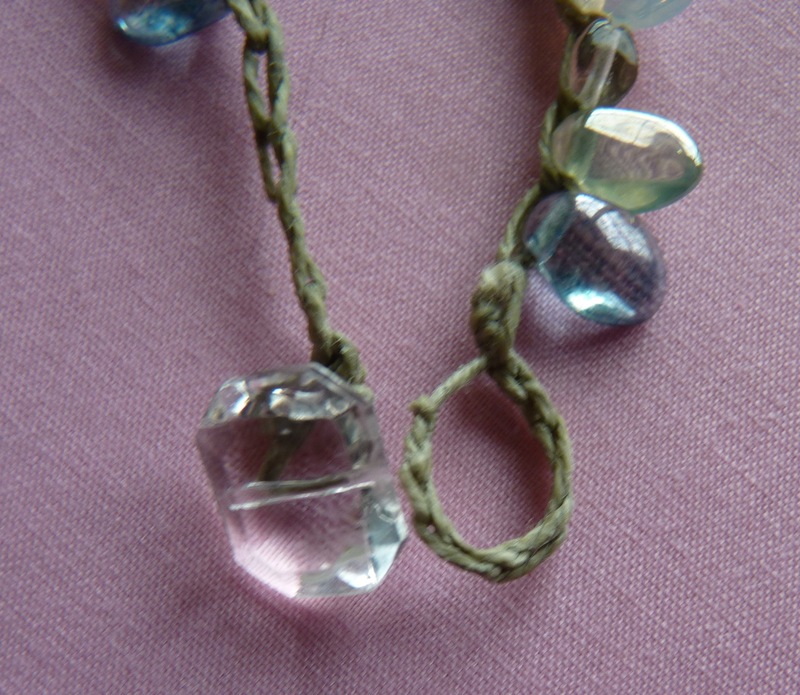 The base and bulb are medium-weight yarn; the garland is a thinner, silver yarn. 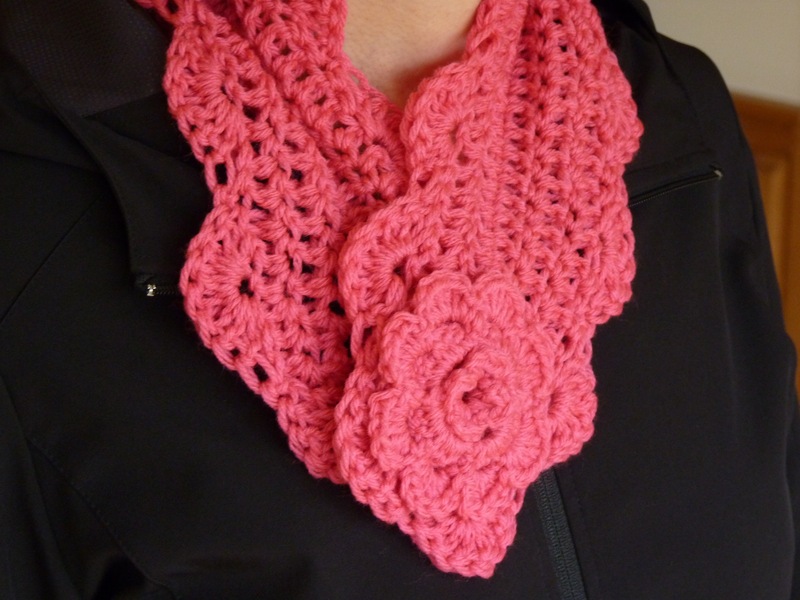 Here’s a crochet scarf for that in-between weather when it’s chilly but not quite deep-freeze weather. It’s quick to make because it’s not very long, plus it’s worked with a size N hook, which is large. The flower is made separately and sewn on. Note the button on the left side – quite a few people commented on the pattern saying that there were no instructions for fastening the scarf. Some people added a button and buttoned it through the center of the flower. I decided to keep the button behind-the-scenes. I thought I’d be able to fasten the button through the back of the scarf behind the flower, but that didn’t work too well. Instead, I made a short chain that I tied on as a loop behind the flower. Here’s a close-up that hopefully shows what’s going on. The loop fits over the button and secures the scarf, but the button and loop aren’t visible. The scarf pattern is Petite Scarf from Lion Brand Yarn. The pattern is free, but you may need to log in to access it. Instead of the flower that’s part of the pattern, I made the flower from an ear wrap I had just finished making. I liked the flower so much, I thought I’d use that one instead. It goes great with the scarf and is just the right size. Ear warmer, headband, head wrap…whatever you call it, it’s a good way to keep your ears warm in chilly weather. 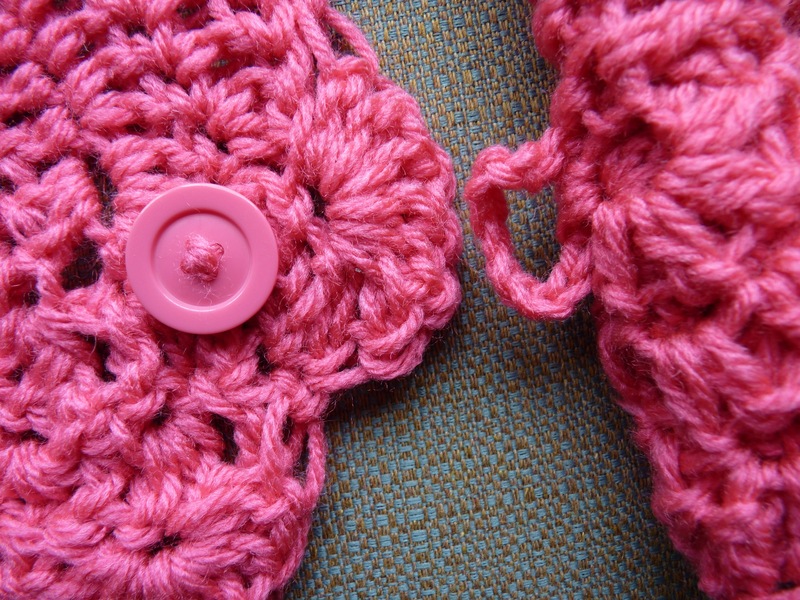 It’s also a super-easy and quick crochet project. I have a stretchy fleece ear warmer that’s very functional, but not very cute, so I’m looking forward to being a bit more stylish this winter. And I’ll be coordinated, because I used the same yarn that I used for this scarf. Next, I made a green one to give as a gift; this one includes the (very cute!) flower that’s part of the pattern. I also gave this one a ribbed effect by crocheting through the back loop. I love how this one turned out and plan to make another one for myself, maybe in a bright color. On both of the ear warmers, I added two buttons, figuring that after a while it might stretch out and then I can switch to the other button (washing it should help it shrink up a little bit too). The two-button technique is good if you are giving this as a gift and don’t know the exact size of the person’s head (I don’t know about you, but I don’t know anyone’s head measurements!). I followed the instructions at Frayed Knot, but instead of counting the rows, I wrapped it around my head as I was making it and kept going until it was long enough. I made the green one a little shorter than the brown one; it’s a gift, and I think my friend’s head is smaller than mine. If you have a button in mind, have it handy and make sure that the buttonhole is the correct size. If you buy a button after you make the ear warmer, take it to the store so you can be sure you’re buying the proper size button. If you’re not familiar with crocheting through the back loop, check out this post to see examples of both loops, front loop, and back loop. The brown yarn is Lion Brand Quick & Easy Mohair Look in color 403, Camel Spray. I bought it a couple of years ago, so I don’t know if it’s still available. The green yarn is Red Heart Super Saver in color 0624, Tea Leaf. The green one is stretchier. Is it too late for candy corn? I have a bag of it in my pantry, so I think it’s still the season. This is an easy, cute crochet project for your fall décor. I made a bunch and put them in this Halloween cat basket. 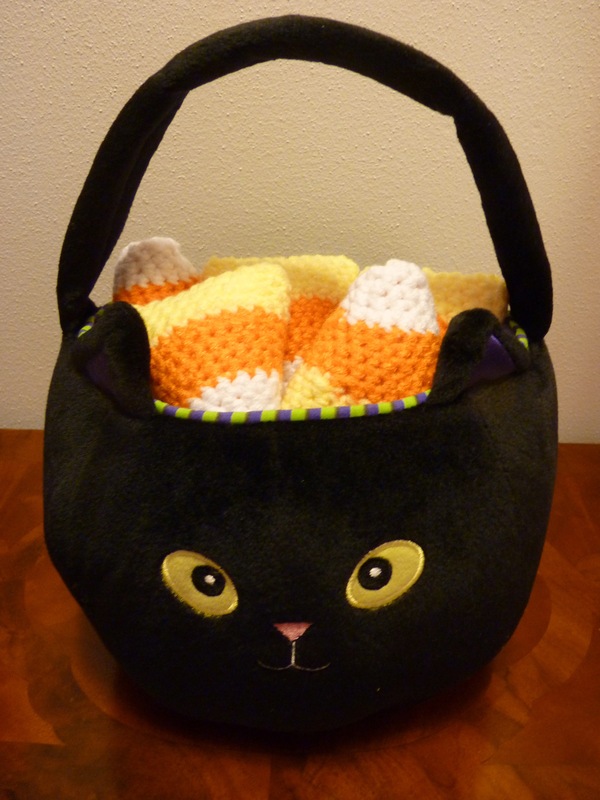 The pattern, called Amigurumi Candy Corn, is here on Lion Brand’s website. (The pattern is free, but you may need to create an account and log in to see the pattern.) 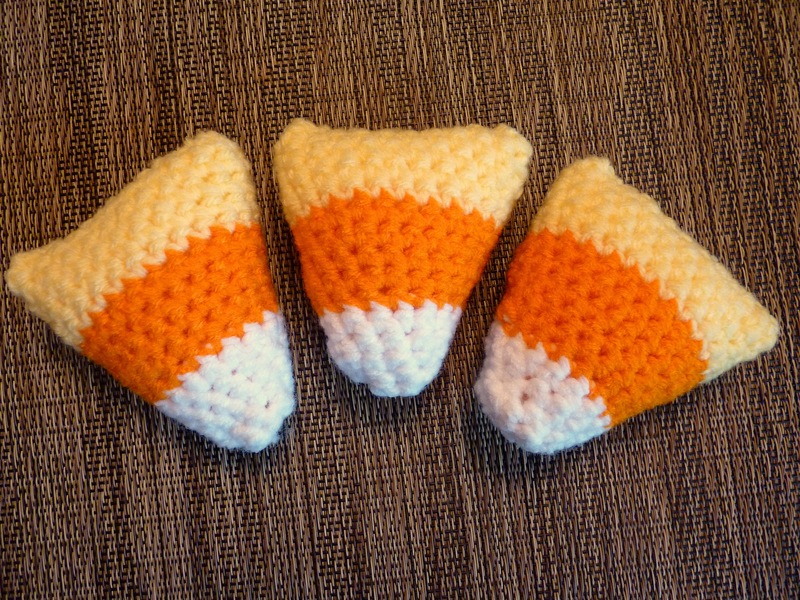 I also saw a bunch of other cute candy corn patterns on Ravelry. 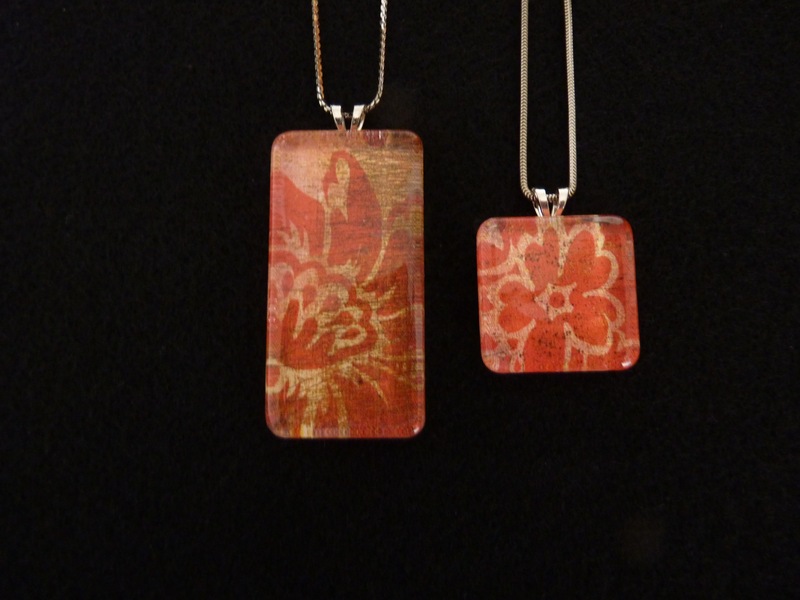 Have you seen these glass tile pendants at craft fairs? They’re easy to make yourself, and if you have a lot of design ideas, you could put together a bunch of these assembly line style. Pretty paper is a good starting point; if you’re a good collage maker, you can add more layers to your design. These are both from the same floral paper. There is a nice tutorial and supply list here on Crafts Unleashed. That’s the blog for the Consumer Crafts website, so the supply lists links to their site. Note that if you sign up for Consumer Crafts emails, you’ll occasionally get reduced-rate or free shipping offers. I don’t like paying for shipping, so I try to save my ordering for when there’s a deal. Of course, you can also shop at your local craft store. It’s nice to have a good-looking back side in case the pendant flips over. The paper I used had a solid color on the back, but if yours doesn’t, you may want to add another layer of paper or add a design on the back. I also bought some round drop charms, but I don’t like how they look. They have a loop at the top that screws into the charm and the screw is visible. If you look closely at the top of the charm, you can see the screw. If you attach paper to the back of the charm, it doesn’t cover it up. I tried the faux soldering technique shown in the tutorial, but it just didn’t look as nice as in the example. Luckily, the memory foil tape is easy to remove. Be sure to clean the tiles with glass cleaner before you start to work. Thicker paper is easier to work with. Work on wax paper, which will help keep the glue and mod podge from sticking to your work surface. Size is a personal preference, but the rectangles are too big and heavy for me. If you’re ordering online, sketch out the size of the tiles and make sure it’s what you want. The larger size might make a nice mini-Christmas ornament. 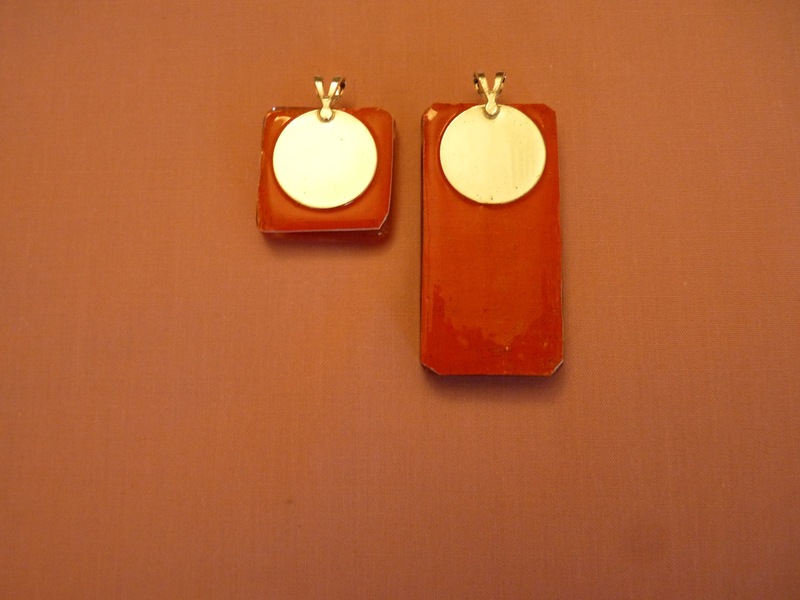 Search online for “glass tile pendant” and you’ll see a ton more ideas. A while back, I pulled out a tote bag full of embroidery supplies which included a couple of unfinished projects. The tea towel already had a coffee pot and cup on one side, and I added a bundt cake on the other side. 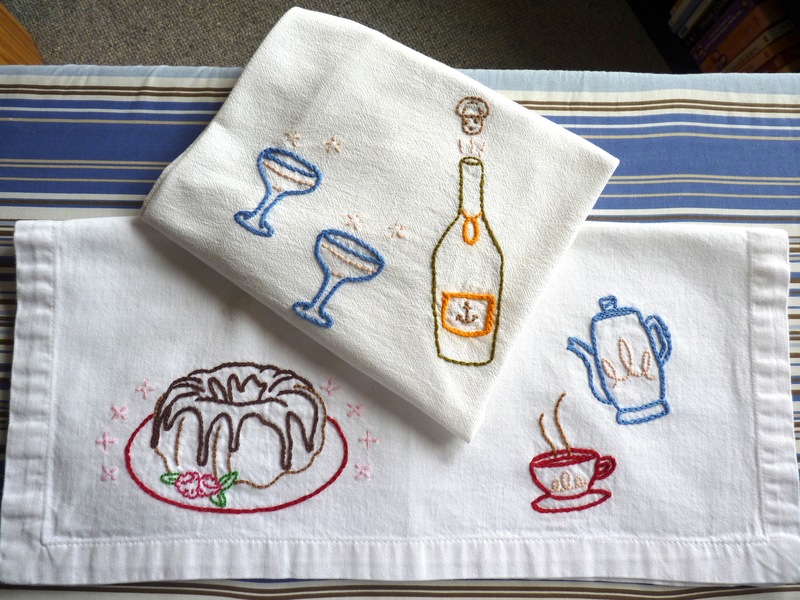 I had a stack of plain flour sack towels, and I stitched a champagne bottle and glasses on one of them. I still have an unfinished 4th of July and Bastille Day towel, which maybe I can finish by next July. I have a ton of men’s handkerchiefs, which come in handy but aren’t very attractive. 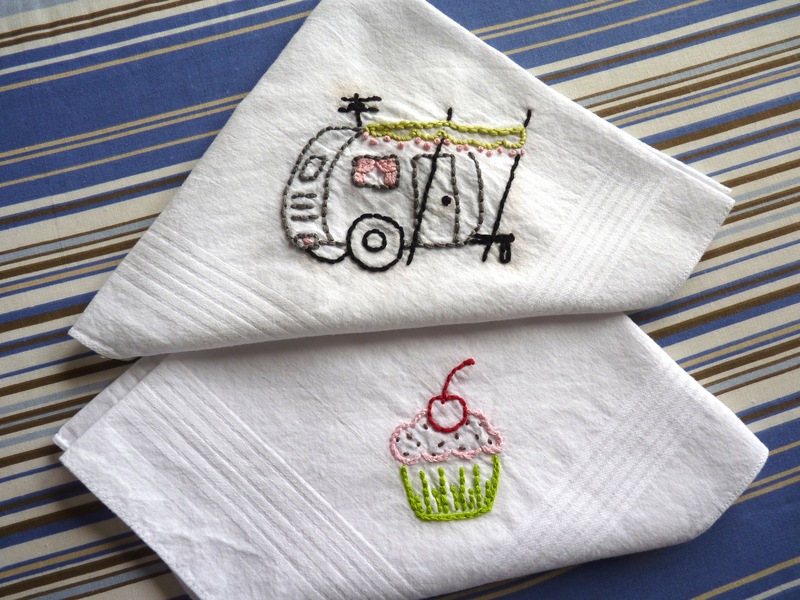 They’re a great place to practice and work on small designs, like this cupcake and camping trailer. Embroidery can get pretty elaborate, but so far I’ve stuck with simple stitches. It’s relaxing and not too expensive – that’s my kind of craft! If you don’t know where to start, there is some helpful how-to information on Sublime Stitching. The cupcake and bundt cake patterns came from a pack of iron-on designs I bought from my local craft store. The camping trailer is part of a PDF pattern called Camp Out that I bought from Sublime Stitching. I bought more cute patterns that I haven’t used yet (Winter Wonderland and Krazy Kitchen). The coffee pot and cup are from the Stitch-It Kit, which I bought a long time ago. The champagne bottle and glasses are from Embroidered Effects, an embroidery book that includes iron-on patterns. This is an easy crochet jewelry project, and it doesn’t even require jewelry-making supplies or skills. It does, however, require a lot of beads. 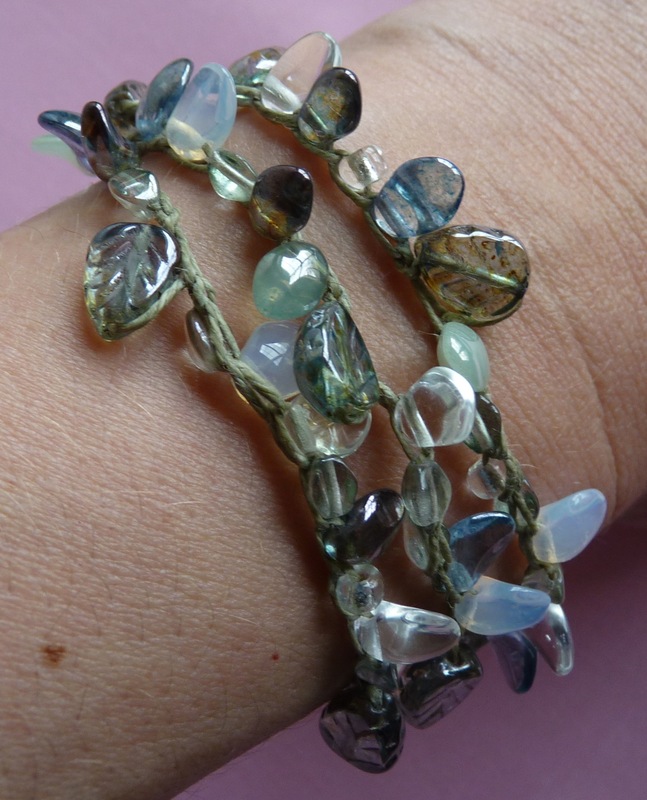 I chose this project because I had some beads to use up, but I had to buy more beads to have enough to make a bracelet. You can make this as long as you want; mine wraps around three times. Here it is not on a wrist. 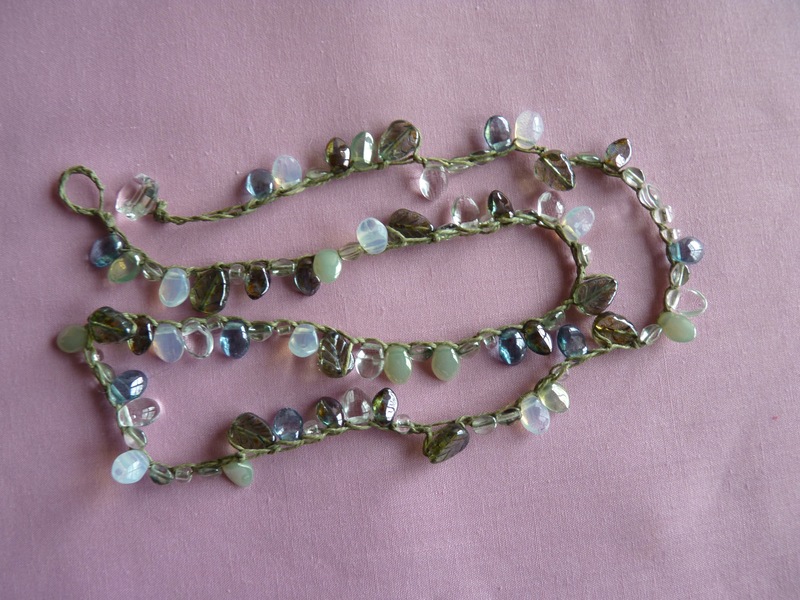 It’s just a long chain of single crochet with beads incorporated. And here’s the closure – it’s a button that slips through a loop of thread. I like how this looks, and I appreciated not having to struggle with attaching a jewelry clasp, which is not my strong point. I even happened to have a clear button that looks like a little jewel. A very helpful video tutorial and a supply list are here. I bought this waxed linen thread from Etsy, which is what she links to in her tutorial post. The thread from my local craft store only came in white; I really like the green color that I used here. Remember to string all of the beads before you start to crochet. You don’t have to use them all, but you can’t add more beads later, so err on the side of stringing too many beads. You are currently browsing the archives for the Crafts category.